All the test suites are collected. 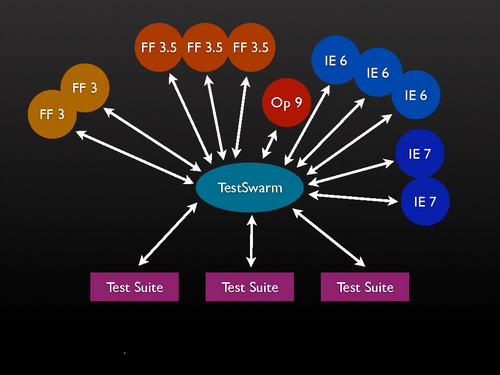 For example, 1 “commit” can have 10 test suites associated with it (and be distributed to a selection of browsers). The nice thing about this construction is that it’s able to work in a fault-tolerant manner. Clients can come-and-go. At any given time there might be no Firefox 2s connected, at another time there could be thirty. The jobs are queued and divvied out as the load requires it. Additionally, the client is simple enough to be able to run on mobile devices (while being completely test framework agnostic). The libraries can also push manual tests out to the users. A user will be notified when new manual tests arrive (maybe via an audible cue?) which they can then quickly run through. All of this help from the users wouldn’t be for nothing, though: There’d be high score boards keeping track of the users who participate the most and libraries could award the top participants with prizes (t-shirts, mugs, books, etc.). The framework developers get the benefit of near-instantaneous test feedback from a seemingly-unlimited number of machines and the users get prizes, recognition, and a sense of accomplishment. If this interests you then please sign up for the alpha. Will it be open source so a company can setup their own farm of VMs to do this distributed testing? Have to admit I thought this was pretty awesome when I read about it, especially when you read John’s reasons why he is pushing for it.